“Shearer told Barton he had made a mistake putting him back in the team, that he thought Barton was good enough to do it but he had shown he wasn’t. “Joey shouted at Alan that he was the best player at the club, which was why he had to play him. Alan said he wasn’t, called him s*** and Joey replied that he was a s*** manager with s*** tactics. Oh dear. Just when you thought Barton couldn’t possibly tarnish his reputation further, he proves you wrong. The boy is like Roy Keane, only with a very small fraction of Keano’s talent. If he really thinks he’s the best player at Newcastle, he needs his head examined -Â and it’s not like Newcastle are blessed with talent. Newcastle United have suspended Barton for two weeks without pay, and I doubt he’ll play for the club ever again. Depressingly, this incident won’t stop another club from giving him a “second chance” (more like eighth chance). What a dickface. Leaving my love for Xabi aside, and i do love him. That was downright one of the single stupidest acts i’ve ever seen on a football field. I’d haveto disagree with the Keane comparison though, Keane usually left it on the pitch (saipan aside) he wasnt stubbing cigars in teammates eyes (does anyone remember he did that). 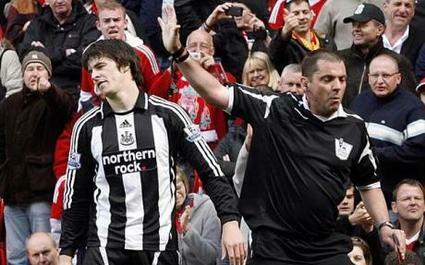 Barton should take a very long, very hard and very serious look at himself before he puts on his boots again.